All wood is a product of nature and much like a fingerprint, no two grain patterns are ever exactly alike. The beauty of real wood is created by the infinite variation of grain, texture, and colour. This is especially true of hardwood and hardwood veneers; hardwoods are particularly noted for their variety in graining. It is the nature of hardwoods to have mineral streaks (light brown, dark brown, to black areas in the wood) and great variation in graining. Since the number of mineral streaks varies from board to board, you may notice differences between cabinets, doors, drawers, or even on the same panel. These characteristics occur due to the fact that wood is a natural product and is affected by weather, climate, insects, birds, soil makeup, and natural growth patterns. 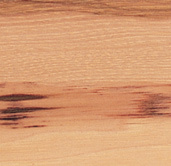 Mineral streaks or unusual graining are considered to be characteristic of natural wood and will not be considered to be a defect or reason for replacement. No special emphasis is made to select materials to match each other. All colour characteristics of wood will change as it ages. This will gradually change the colour of the wood and stain. The amount and rate of the change will depend on many factors, including wood type, stain colour, and the amount of direct sunlight. In addition, exposure to smoke, chemicals, and man-made light may, over time, cause some materials to vary from their original colour. While this softening of the colour is not noticeable day to day, it will make a difference over an extended period of time. This is why furniture added at a later date may not exactly match previously purchased pieces. For the same reason, stain samples or display pieces may not represent the exact colour of furniture you receive. Due to these natural and environmental factors, you will understand why Woodworks cannot be responsible for naturally occurring changes experienced by the wood in your furniture. The natural occurrence of expansion and contraction, may also affect your doors, drawers and face frames. 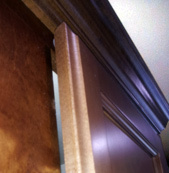 Expansion and contraction in doors, drawers and face frames can also open a joint line. This is not a flaw in the wood or manufacturing process. The finish will still protect the surface and the structural integrity of the joint will not be affected. When purchasing painted (opaque) finishes, keep in mind that the natural occurrence of expansion and contraction greatly affects the overall look of the wood products. Because of this, it is perfectly normal to experience some separation at joints in wood.Although we take every precaution to minimize this, it is completely natural. It is recommended that a humidity control system is incorporated in a home to reduce the possibility of expansion and contraction in wood products. 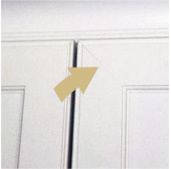 Door panels are prone to minor expansion and contraction as seasonal temperature and humidity changes occur in a home.The contraction or shrinkage of the centre door panel during low humidity periods may result in the appearance of an unfinished line along the edge of the centre panel. It is recommended that a humidity control system is incorporated in a home to reduce the possibility of expansion and contraction in wood products. Touch-up markers are made available to cover this edge line. Often times, touch-up may only be necessary within the first year. The natural occurrence of expansion and contraction, may also affect your doors, drawers and face frames. 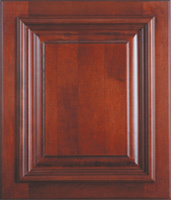 In some case doors may warp for a period of time until the home has inCorporated it’s humidity control system. Special hinges are available to readjust some of the warpage out of the door, until the humidity control system has regulated the environment. 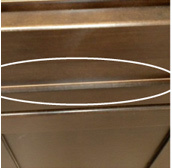 Remember, proper initial care and maintenance will ensure a lifetime of beauty and enjoyment of your new cabinets. End grains appear darker, as the stain is absorbed more due to the softness of the wood. 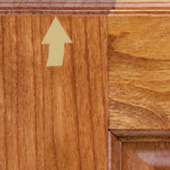 This is most commonly seen on the Mortise and Tenon jointed doors. This is a natural reaction when the stain is applied, This is not a deemed as a defect. An olive or greenish-black or brown discolouration of undetermined cause in hardwoods, commonly caused by minerals which the tree extracts from the soil, or other injuries that occurred during the growth process. This is common in many types of wood products. Wood continue to age in your home. Some wood products like Cherry will darken faster than others. For those who appreciate the unique features that wood products offer, This transformation will continue to bring rich lustres to the product as time moves forward. Our stain finishes are semi-transparent to enhance the natural beauty and character of our products. 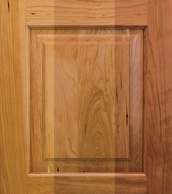 While we offer an extensive range of stains and colour tones, colour may vary based on the underlying wood products. © 2019 Woodworks Solid Wood Furniture Mfg.